This article is an extensive update to the MSDN article of the same name. I saw that article two months ago and it was only with the help of Microsoft C++ MVP John Czopowik that I was able to make Windows Source Debugging work under Visual Studio 2010. I hope this article saves other people from the same frustration. These instructions are for developers who have a Windows source code license and access to Code Center Premium. 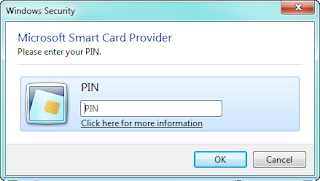 Connect your SmartCard reader and insert the card you obtained from the Shared Source Initiative. Make sure your smart card certificate is working by opening Internet Explorer and going to https://codepremium.msdn.microsoft.com/. You should see prompts as shown in Steps 3 to 6 under Sample Walkthrough, below. This must work properly before you proceed with these instructions. 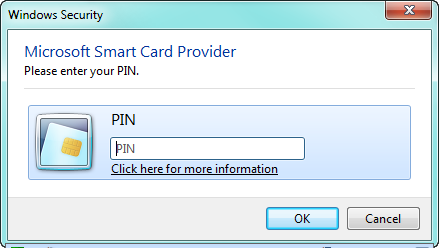 Do not use Firefox because Firefox does not support smart card authentication! Set both SecureSourceLocalDirectory and SourceServerExtractToDirectory to the same directory. The directory does not have to already exist. In the Options dialog box, open the Debugging node and click General. Clear the Enable just my code (Managed only) check box. Select Enable Enable source server support. Select Print source server diagnostic messages to the Output window. Under the Debugging node, click Symbols. Move this location to be second in the list to ensure that these symbols are loaded first. (You can't move it to the top. Microsoft Symbol Servers is always first, but you should have unchecked it.) 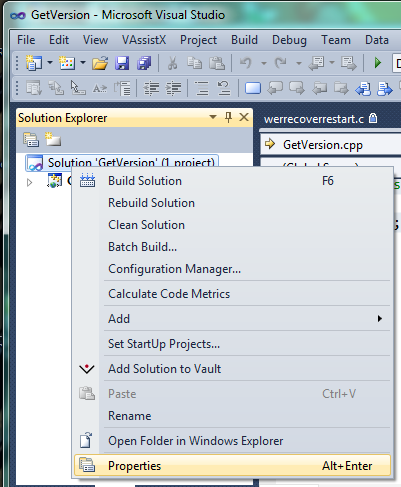 Visual Studio 2005 and 2008 users: In the screen shot below, note the third entry in this list, C:\Windows\symbols\dll. This directory is where the MFC and C run-time symbols are installed by Visual Studio. These symbols are not part of Code Center, so you need to include them if you want to debug into MFC or the C run-time library. Visual Studio 2010 users: You don't need the reference to C:\Windows\symbols\dll. Visual Studio always looks there, even if it's not in this list. In the Cache symbols in this directory box, enter a location such as C:\symbols where Code Center Premium can cache the symbols. This location should be DIFFERENT from the location used to store public symbols when Microsoft Symbol Servers is checked because symbols already downloaded from the Microsoft Symbol Servers will prevent symbols being downloaded from Code Center Premium. Under Common Properties, select Debug Source Files. Note that spaces must be replaced with %20, and you cannot browse to this location in your browser. In the same window, make sure that the list under Do not look for these source files is empty. 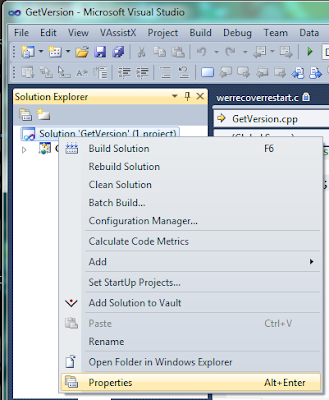 Close and restart Visual Studio to ensure that settings are persisted. // Can't step into this function. You get a "not indexed" error. // Set a breakpoint on this function, then try to Step Into it. // Stepping into this function should work too, but not on XP. Set a breakpoint at GetConsoleMode in the sample code. 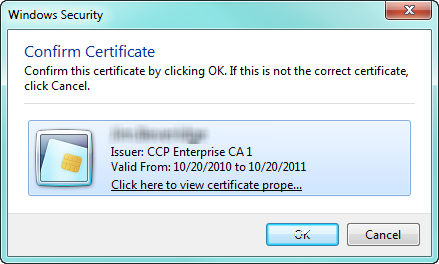 You should see the Confirm Certificate window. If not, your smart card isn't working. You'll be asked to enter your PIN. You received this in your email confirmation that welcomed you to Code Center Premium. It may take a while to get started because the private symbols must be downloaded. Since they contain full debug information, they are much larger than the usual symbols. Note that kernel32.dll shows "Symbols loaded", whereas KernelBase.dll shows "Symbols loaded (source information stripped). If kernel32.dll also shows "(source information stripped)", then you are using the wrong symbols. The most likely cause is if you didn't set a different cache directory for private symbols. Also note that the timestamp for both kernel32.dll and KernelBase.dll is 7/13/2009. This means that they are RTM DLLs for Windows 7. The timestamp for ntdll.dll is 3/23/2010, which means that it's been updated and you can't step into it. So it is possible to debug on a patched system, but it's hit or miss because many DLLs have been patched and so can't be stepped into. This command will be executed by the Source Server at Code Center Premium. It will NOT be executed on your computer. You do not need to have SD.EXE on your computer. You should now be looking at Windows source code. SRCSRV: Source server cannot retrieve the source code for file 'd:\w7rtm\windows\zzz\zzz\zzz\zzz.c' in module 'C:\Windows\System32\kernel32.dll'. The system cannot find the file specified. Note that Source Server is actually showing an error. In spite of this, debugging still works properly. You can't debug any hot fixes, security fixes or operating system updates. You can ONLY debug the RTM release or a service pack. In practice, this usually means that you are remote debugging a virtual machine that was installed from the DVD and Windows Update has been turned off. 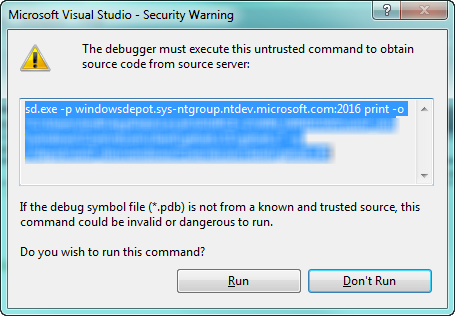 The debugger won't step into some Windows functions. This usually means that you are trying to step into a DLL that's been updated since the original release. Are you debugging a 32-bit app on 64-bit Windows? You can't debug Windows source in this case. Run the 32-bit code on a 32-bit version of Windows in a virtual machine and use Remote Debugging. Are you trying to step into the Windows kernel? Kernel debugging is different from user mode debugging. You must use WinDbg for kernel mode debugging. Is the source code missing on Code Center Premium? This would be the case if you are getting the error SRCSRV: ... not indexed. Please see the section below titled ANSI versus Unicode Functions. Are you seeing a warning about an "Untrusted Command"? This is normal. Just click Run. Can't step into a Windows API function? Make sure you have symbols for the DLL. Look in the Modules list and make sure that it does NOT say "Source information stripped." If it does, clear your symbol cache and run your app again. In Virtual PC on Windows 7, go to the USB menu and select USB SmartCard Reader. You will be prompted to install the drivers in the virtual machine. The smart card will be DISCONNECTED from the host system, so you will not be able to use it in the host machine until the virtual machine releases it. You do not need to do this if you are using Remote Debugging to run your application in the virtual machine. The problem with " PathRemoveExtensionA" seems to be a "build feature". They implemented the file only once for A and W and then you uses this file without "A, W"... In this case, the source file is called "path.c" and is referenced as "patha.c" (A) and "pathw.c" (W). If you want to debug into this files, you need just to copy the source from the CCP-Website for the "TCHAR" version and save it wherever you want with the name "patha.c" and/or "pathw.c". Then if VS askes you for the file, you can just use this file. It will exactly match. Here is the list of all currently available source server paths. Links are not clickable because these links are only for use in Visual Studio, not in your browser. That is based on the same codebase as Server 2003.